In the process of reading Scripture there are those wonderful moments when a verse or part of verse that you know well, resonates anew. There is a wonderful passage in Colossians 1 vv 9-14 where Paul paints a glorious picture of the journey of the Christian’s redemption. A phrase in our staff devotions the other morning that sent tingles down my spine was “and brought us into the kingdom of the Son he loves“. When this part of the passage was read my mind immediately drifted into a reverie and, I must confess, I missed what was said after that. (Sorry Bruce!) A majestic king, regal and magnificent came to mind. Majesty and awe intertwined with the fact that I have been invited as a citizen of this Kingdom. I have been “brought in”. What an immense privilege! Me! A citizen of the Kingdom of the father’s son! Moreover this Kingdom is anchored in the love the Father has for His son-king. This is no ordinary human kingdom. “The kingdom of the son He loves” is different from imperfect human examples. Rather it is pristine, perfect and eternal, underpinned by grace and relationship, from the Father to the son-king and to me. I awoke from my reverie and it was time for prayer. But the moment away in my thoughts was special. In the magnificent Cathedral/Mosque, the Mesquita in Cordoba, we came across a bizarre sight in one of the alcoves. 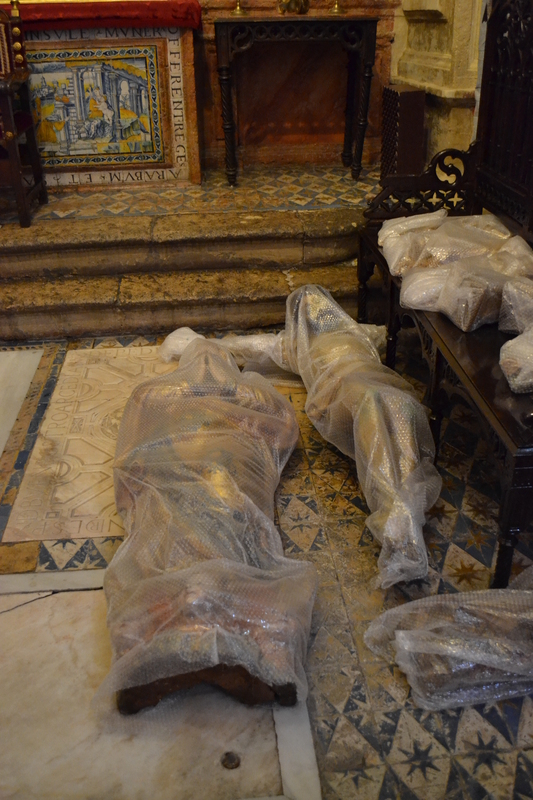 Large representations of Jesus and Mary, which had obviously been used for the Easter festivals, were wrapped in bubble-wrap protecting them until next year’s celebration. Being an English teacher, I see metaphors in most things, but this metaphor was screaming at me! For me it was a picture of how Jesus is so often treated: the Jesus of Christmas and Easter or the Jesus who comes out at hard times and forgotten about when things are OK. The token Jesus. The aspirin Jesus. Even those of us who profess a strong faith have times when we remember to pray with a passion, only, because there is an issue that needs to be dealt with in our lives. At other times we have placed Jesus in “bubble-wrap”. 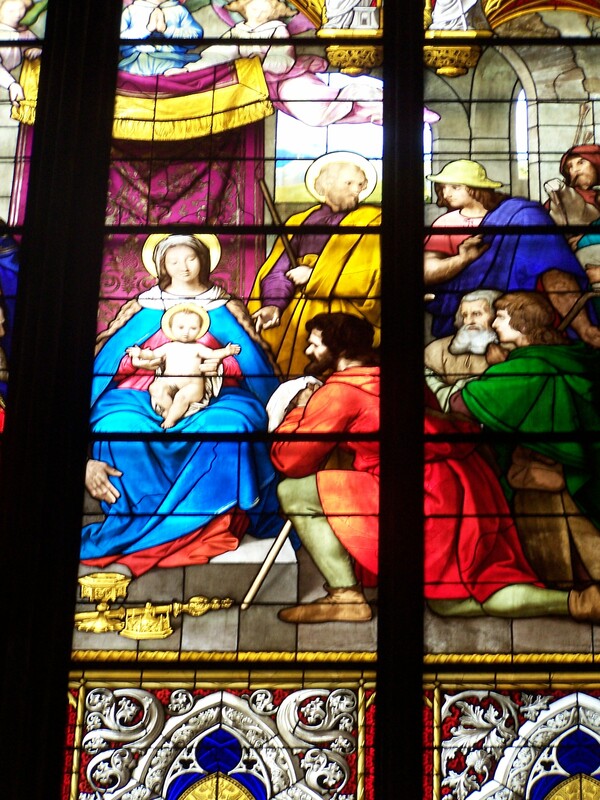 The image in Cordoba was a reminder for me personally, to be aware of how I treat our Lord. I am his child, He is not at my beck and call. Jesus is my 24/7 Lord, not my occasional remedy. 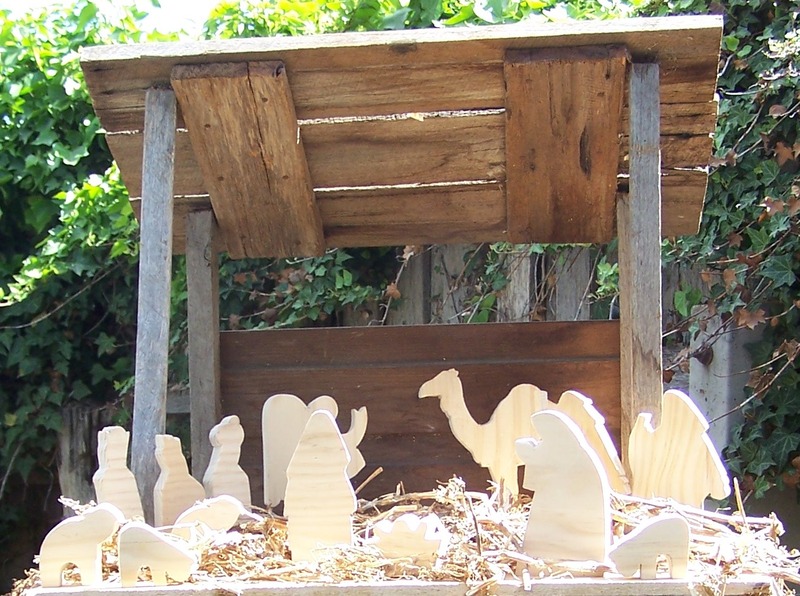 When re-reading the Christmas story it is easy to come with preconceived images. “Packaged” concepts of what the story is about. Over the last few weeks I have tried to re-read these stories with a fresh set of eyes. 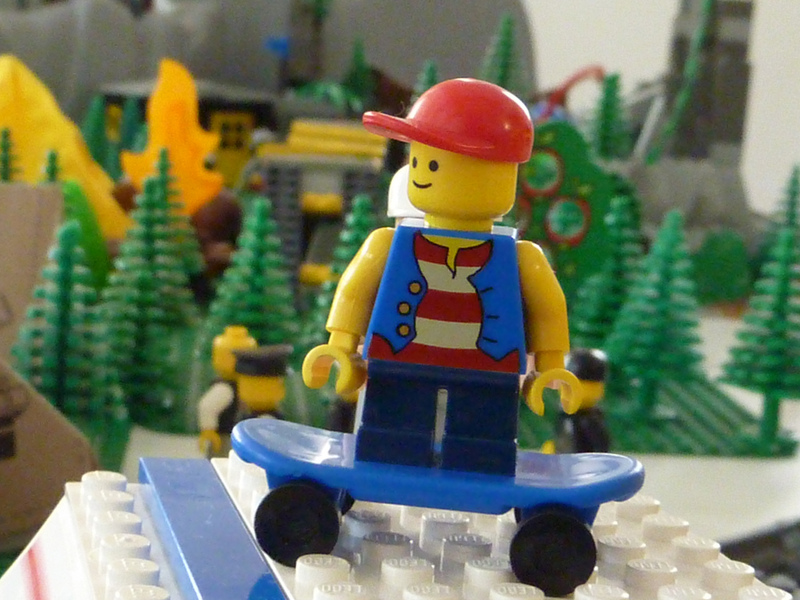 The two over-riding words that struck me were: 1. Humanity and 2. Divinity. In these Gospel stories we are confronted with the raw humanity of Mary; a young, frightened girl who has to deal with the consequences of God’s decision. There would the rumours, the gossip and the caring for a baby to deal with. There is the quiet dignified humanity of Joseph, who having behaved properly towards his betrothed, is flung into a situation beyond his will and his making. Joseph takes this all in and behaves true to his gentle, caring, character. There are the rough shepherds, vulnerable and open. They are the least of men but are some of the first to see God incarnate. You can imagine these rough men, embarrassed, awed and awkward, but overjoyed, wondering what to say or do next when they meet the young mother with her new baby. They don’t meet too many people – especially young mums and babies. The wise men are different again. They followed their learning and instincts, but most of all the leading of the Holy Spirit. These were men whose hearts were open to God even though they came from outside the Jewish culture. These men were a portent of the millions to come to Christ over the next 2000 plus year from many different places and cultures. God in the midst of humanity, God coming to us and dwelling among us, God as one of us. How amazing! Have you ever contemplated the concept of being separated from the love of God? Now I know the true child of God cannot be separated from that love, but just think if it were possible. What would go though your mind? Horror? Fear? Despair? Probably all three and much more. Well, that would be true for me. The idea of being separated from God’s love defies my imagination. It horrifies me. It is too terrible to contemplate. Why do I ask this awful question? Because when I look at the members of the body of Christ, including, sadly, my own heart at times, I don’t see the thankfulness, relief, joy and gratitude of people who truly understand what the love of God means. Maybe as an antidote we should reflect on what it means to be outside it; to imagine what being outside that sphere really means. I believe such a genuine reflection would have at least two (possibly more) results. One result would be, our sometimes casual, complacent and neglectful relationship with God would be dealt a severe blow. Greater thankfulness, obedience, joy and probably, relief would be visible in our lives. We would live the Spirit filled life that redeemed people should be living – can be living. The second consequence would be a greater passion to see others saved. Understanding what it means to live outside God’s love, I believe, is a great motivator for our lifestyle, words and attitudes towards those who haven’t grasped the love of God through faith. I know we can’t force people to believe, but living like people who know what they have been saved from should be obvious from every atom of our being. May our prayer be to live lives that comprehend the amazing and eternal love of God. 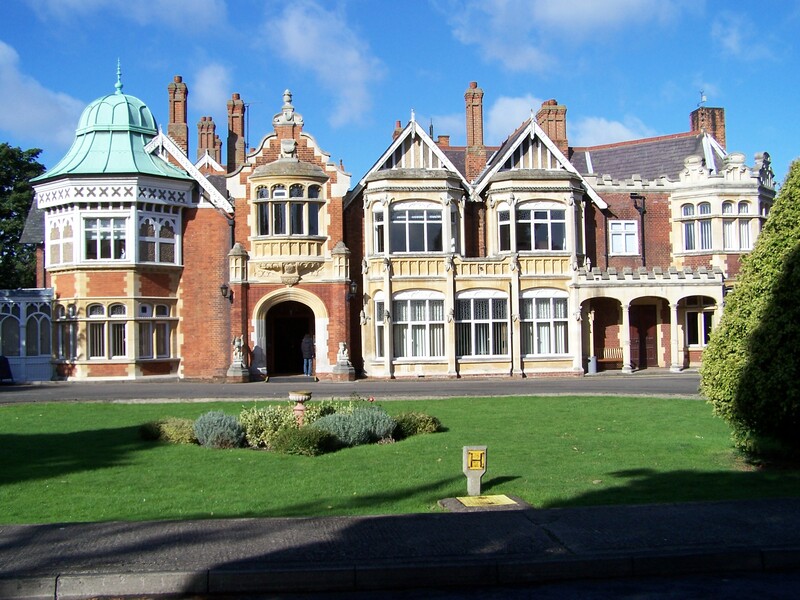 In 2005 one of the first things I did when we arrived in the UK was visit Bletchley Park. It was just across the railway line and up the road a little from where we lived. As I didn’t have a car, it was an easy visit that I could tick off my list of things to see. 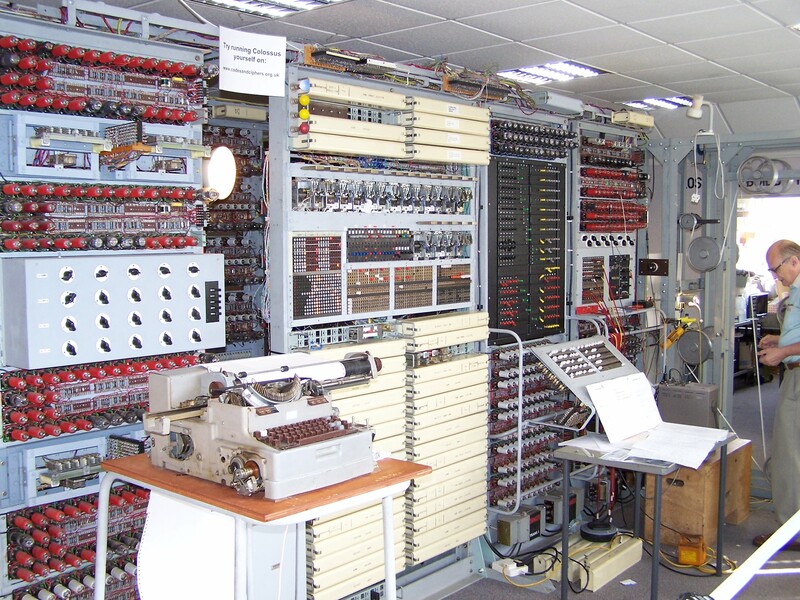 Bletchley Park was/is home to to the first programmable computer – the Colossus (in recent years it has been restored). 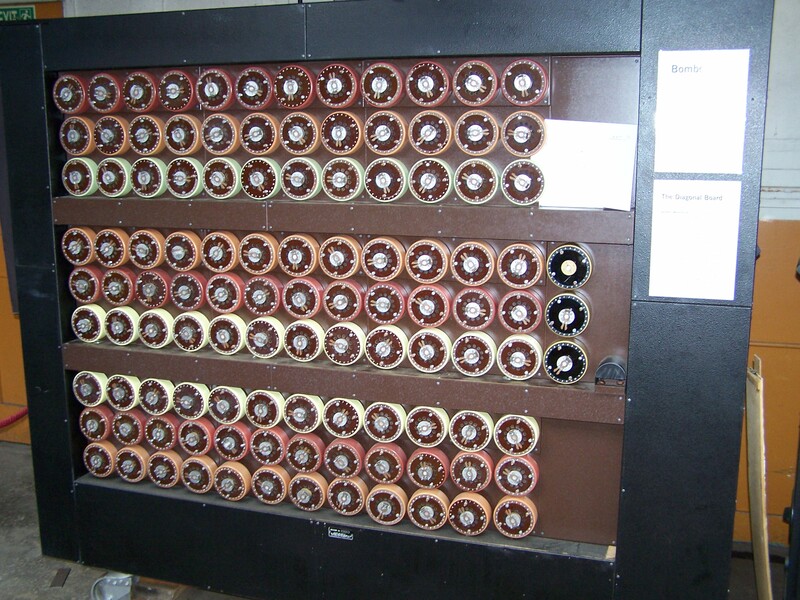 It was utilised to decipher the German Enigma Code, a sophisticated encryption machine used to encrypt secret messages to be sent around the Reich – particularly to ships. Cracking the code made a huge difference to the Allied war effort. Where does the Bible fit into the picture? Many people I come across treat Scripture like an encrypted German message and they respond in a variety of ways. Some tell me the Bible is too complicated and they can’t be bothered decoding it. Others spend a lifetime searching for the key. Like some human “Colossus,” their brains are whirring away trying to decipher a secret code that underpins the Bible. If it is not a form of numerology, it is another scheme they try to develop by which the “truth” may be found. Countless hours have been spent and many books written on aspects of Scripture that, sadly, do not draw us closer to the truth. In fact, the truth of Scripture is quite plain. Maybe it is too easy! The truth of the gospel is quite simple. We are sinners. We cannot in our own strength be reunited with God, so God sent His own son to take the punishment we deserve, by which the affront to His holiness is dealt with and we can be restored to God. And even at this point God applies this truth through the amazing person of the Holy Spirit. In short, we have a triune God dealing with our deepest needs. All we need to do is believe and accept the gift He offers.Now how complicated is that?! There are no spiritual gymnastics required and any efforts on our part to obtain salvation are of no use. The apostle John wrote nearly 2000 years “For God so loved the world that he gave his one and only Son, that whoever believes in him shall not perish but have eternal life. (Jn 3:16) It was true then. It is true now. Yes there is more, There is the Kingdom of God, there is the call of God on the life of His children, and many other wonderful qualities. All of these extra truths are anchored on the simple gospel truth mentioned in John 3:16 (above). One final anecdote: I had a wonderful cousin who had Down Syndrome. Stephen understood the gospel and was in love with his Saviour. The gospel message was simple enough and clear enough for him to understand and clasp to himself. He loved telling people about God’s love for them. He did not need a secret code book, or a spiritual decrypter. All he had was a simple faith. That was all he needed. 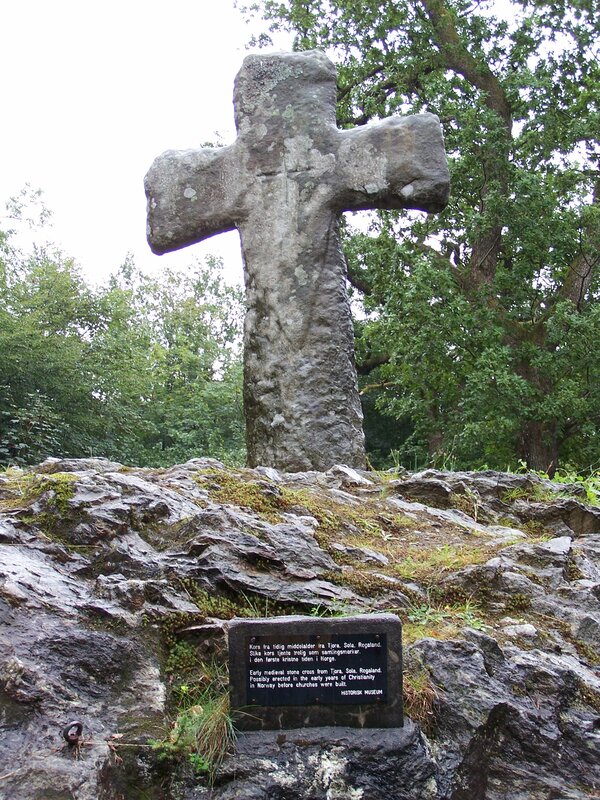 Christians – Have You Said Thank You? Have you ever said thank you; thank you to all those involved in your salvation – your membership of the Kingdom of Christ? For those of us who have been around Jesus for a long time there have been many who either led us to, or helped us remain faithful, to the name of Jesus. Naturally, the abundance of our thanks and praise must go to God who through Jesus is the author and perfecter of our faith (Hebrews 12:2). Our thanks to the Father who sent the son, the son who died in our place and the Spirit who applies that faith to our lives, can know no bounds. However, there are many other who have faithfully laboured as instruments of God’s love and grace in our lives. taught and shown what the gospel means. Then their are grandparents and other family members, friends and church members who have done the same. Think of the pastors who have faithfully taught God’s word and prayed for you. If you are a reader, Christian books will have led you you and challenged you on your journey and opened up previously unconsidered vistas. For those who have come from a non-Christian background, who did God use to reveal life to you? Who assisted in you in those first baby steps? Who has continued to encourage you? Providence (which we often call chance or accidents) has meant there have been unknown people and events who have made an indelible mark on your life due to a, seemingly, chance meeting. They may have given you a sense of direction or calling, picked you up at a low moment, challenged or chastised you. So, have you said, “Thank you”; first of all a life of praise to God for what he has done and the people and events he has placed in your path? And, have you said thank you personally to the parents, friends, pastors and others who have confirmed you as a child of God’s? If you are like me you tend to take these people and events for granted and need to be reminded of how profound this cloud of earthly angels really is. They are all signs of God’s love for you. Have you said thank you? If not, now is a good time. For those we need to thank who have passed on, send up a prayer of thanks. They’ll get the message. In my devotions at present I am being reminded of sin; the original sin, my sin, even your sin and the consequences. The photo (left) reminded me of consequences. I imagine that many, many years ago an enterprising person went around this cemetery planting cypress pines with the aim of beautifying the place. 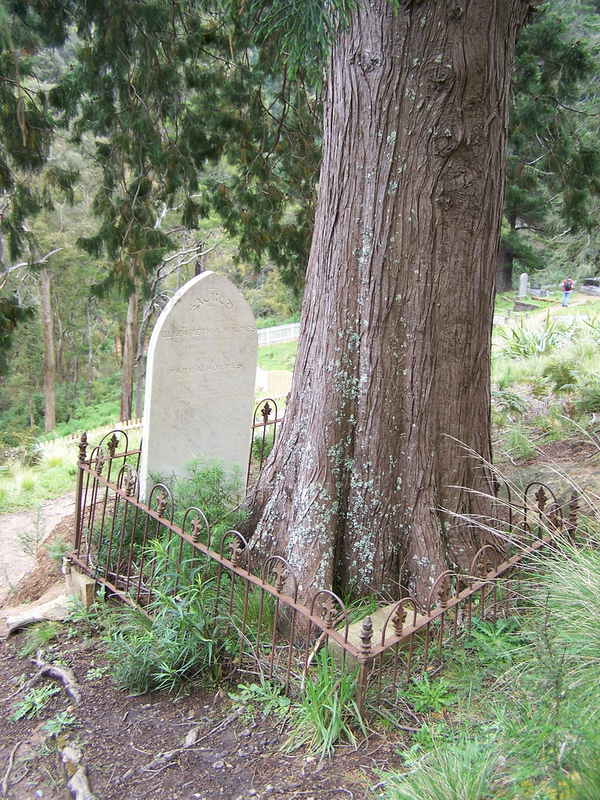 Little did he or she realise that in 120 years, the cute little sapling would dominate the grave. 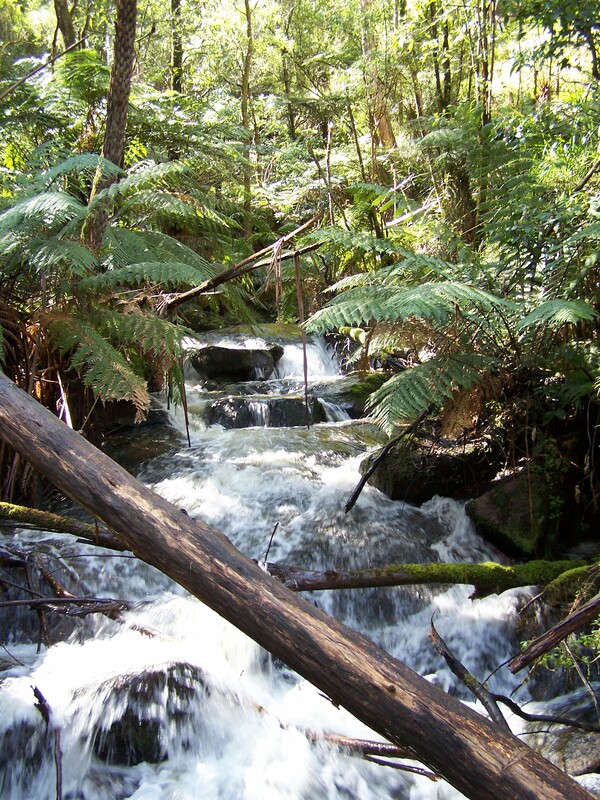 Little did Adam and Eve realise … little do we realise the lie, the cheat, the disobedience, the selfishness, the arrogance, in fact, any of the sins we tend to call “little” or “white”, have an impact on ourselves, others and our relationship with God. We just let them shoot, grow and develop. Sometimes the consequences are not there for us to see immediately. Sometimes, like the cypress tree, it will only be evident in the distant future. That is when the full impact is revealed. For the Christian, forgiveness is always at hand. We are usually not slow at appropriating it. I must add, I’m all for it. However, we often forget about confession, reconciliation and restoration. There are consequences to deal with. The hurt, the anger and the disappointment, often weighing on people who are close to us, still needs healing. Bridges need to be built. We still need to ask, “Will you please forgive me.” Sometimes the answer might be,”No. I’m not ready yet.” That is a consequence we need to live with. Yes, God forgives, and He looks at His children through Christ coloured glasses. He sees us as guiltless and innocent through his son but that mustn’t stop us from taking steps to stop the cypress trees from growing in places where they can do great damage. His warm but firm gaze is on you. You can’t escape his eyes. Is your response the same as Peter’s? “You know I love you.” Is it true? Is it unshakeable? Will it stand the test of temptation, persecution or, more likely, ridicule? And what about, ” … more than these?” Are “these”, other people or are they things, self-esteem and prestige that clutter your life? Either way, do you love Jesus more than “these”? As Peter is being restored to his relationship with Jesus, he is also being prepared for the hard task of Kingdom work … the hard task of being Christ’s hands and feet when Jesus returns to heaven. Sound Christian Education takes the Bible seriously. Truth is seen as absolute. Christian Education believes a Christian worldview can make a positive difference. It gives students a strong foundation in a world of shifting values and morals. therefore God’s claims over all of creation are taken seriously. No subject or curriculum is outside the orbit of God. Students are recognised for who they are: sinners in need of God’s grace in Christ. Also students are given a vision of God’s Kingdom and their place in it. challenges them to achieve their amazing potential. It assists parents in their God given mandate. Sound Christian Education treats the student as a whole person whose aim is to grow in Christ-likeness..
A foundation in God and His world prepares the student for tomorrow. Healthy Christian Education develops critical thinking by having the courage to explore other world views from the perspective of its own worldview. What reasons can you add?